TEWKSBURY, MA -- Next Saturday, February 9th, the Boston Jr. Rangers will play host to the New Hampshire Avalanche in an 8:10pm matchup at the Breakaway Ice Center. In addition to some great hockey, the game will serve as a benefit to raise vital funds for the thousands of disabled veterans served annually by Project Healing Waters Fly Fishing, Inc. (PHWFF) programs. "We are honored by the support of the entire Boston Junior Rangers organization and community. Together we can continue providing our unique form of therapy to those who have served, and sacrificed, for our great Nation. We are looking forward to a great night of hockey!" - Todd Desgrossielliers, President and CEO Project Healing Waters Fly Fishing, Inc.
Tickets for the game can be purchased at the door voluntarily for $5.00. All proceeds go to support the recovery and rehabilitation of our Nation's disabled veterans through PHWFF. 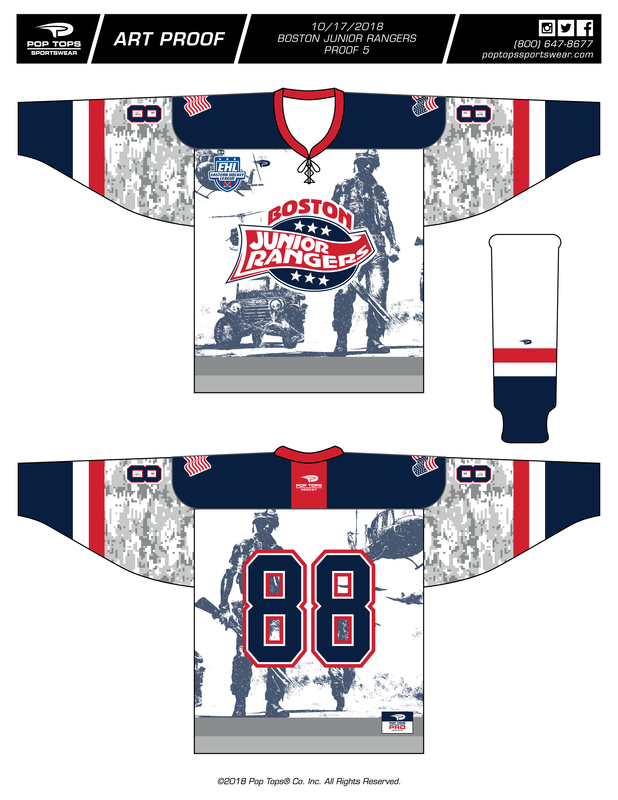 In addition to tickets, the Boston Junior Rangers have also established an online fundraising site to further contribute to those who have made great sacrifices in the service of our Nation. You can visit it at www.gofundme.com/projecthealingwaters. The Rangers will wear these special military-themed uniforms on Saturday, designed and created by Pop Tops Sportswear.